In today’s IT environment risk and threats to your company can come from anywhere, internal (disgruntled employees, vendors, , contractors), or external (organized crime, competitors, protesters, nation states). It is crucial that you identify your digital assets (PCI, PII, PHI, Banking, Marketing, Customer, Payroll, AP, AR, W2, Test, Back Ups, Paper, etc. ), the threats to those assets, and the controls you have protecting the confidentiality, availability and integrity of those assets. 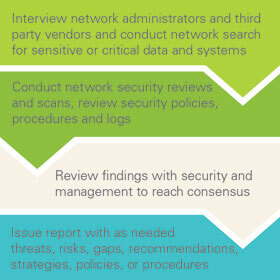 Schneider Downs offers this type of security review and consultation to help protect your data. With this review, Schneider Downs seasoned professionals can also assist in defining strategies and developing policies and procedures customized for your business environment. We can build or assist with creating programs for security awareness and information security compliance. In addition, we can share our experiences as to which products or vendor security services may best meet your needs.